The first thing to note is that most GPs and health professionals in the UK have never even heard of misophonia. The second thing to note is that even if they did – and we finally get to the stage where misophonia, like other neurological disorders such as dyslexia or ADHD is officially recognised – it doesn’t make any difference in terms of the available treatment. As things stand there’s no magic button, pill, or brain zap to eliminate misophonia. However if you’re desperate, there is still a route you can take to try and get help and that’s what I’ll take you through in this article. As it stands this is the only route via the National Health Service that I’m currently aware of. In terms of diagnosis and treatment in the UK, misophonia currently straddles a strange space between two different, but not wildly disparate disorders: tinnitus and hyperacusis. Tinnitus – You might be familiar with tinnitus already, it’s a ringing in the ears and has been a well documented condition since at least the Roman times. If you already have tinnitus, you’ll know about it. If not, you can probably relate to it – it’s that constant tone or buzzing sound you sometimes get in your ear after listening to really loud music. Hyperacusis – Is an acute sensitivity to volume. You might feel panicked or alert when certain noises are at a volume that other people feel completely comfortable with. This disorder is similar in a number of ways to misophonia. The physiological reactions that take place, such as quickened heart rate and heightened state of alertness, are often the similar, as are any feelings of panic, anger, fear or frustration. It’s common for people with misophonia to have one or both of these disorders as well. If you’re reading this and thinking “I HAVE THAT TOO!” don’t panic, you’re in good company. Even though misophonia still isn’t officially recognised as a disorder by the British Medical Association (BMA) there does seem to be a tacit acknowledgement of the symptoms on the NHS website under ‘hyperacusis’. With that in mind, the best available treatment for misophonia in the UK that I’ve come across to date, comes in the form of therapy from an audiologist and/or occupational therapist who is familiar with auditory processing disorders. It is worth pointing out that you won’t get an official diagnosis of ‘misophonia’ from the NHS. I’ve spoken to an audiologist who has, knows and talks about misophonia but won’t write it in her reports as it’s not currently recognised by the BMA. However, if you’re lucky enough to get a good specialist (and you’re persistent) you might be able to get treatment. How can you get treatment for misophonia on the NHS? The first thing you need to do is to book an appointment with your GP. Explain your symptoms clearly and calmly and try to focus as much as you can on the auditory aspects. If you have a problem with volume (as mentioned above) definitely mention this upfront. It’ll be FAR easier for them to refer you to a specialist for suspected hyperacusis. Of course you should express how certain noises can make you feel, but if you spend the entire time talking about how angry or unhappy or upset you are, you risk getting a possible misdiagnosis for anxiety or depression, or more commonly obsessive compulsive disorder. You may be suffering from one or more of these disorders as well, but it’s very important to focus on your specific symptoms. They might then be able to refer you on for suspected hyperacusis or even auditory processing disorder (if you have trouble distinguishing certain sounds). If so great – you’ll be heading to the right type of specialist. You’re ideally looking to get an appointment with an ENT specialist (ear, nose and throat specialist) or an audiologist. If you get a good one, who’s familiar with misophonia or at least hyperacusis, they may be able to offer you treatment in-house, or with an occupational therapist who’s qualified in working with auditory processing disorders. Obviously this is just a guide. 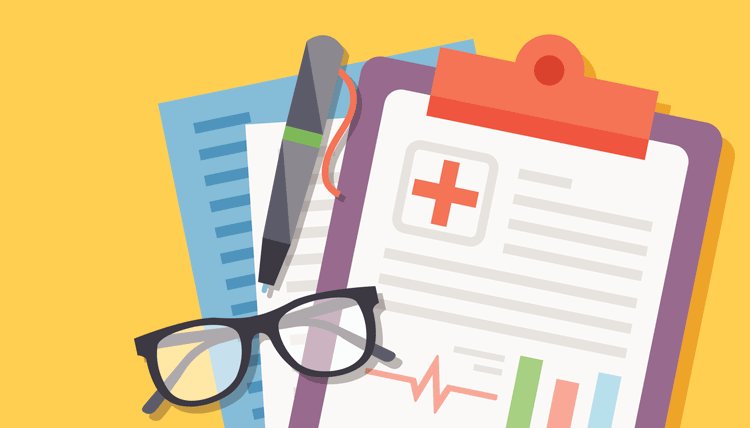 There are no guarantees and unfortunately treatment and diagnosis on the NHS can be a bit of a postcode lottery, but if you’re looking to get treatment via the NHS this should help you get started. The best thing anyone can do to help you (or a loved one) is to provide a better understanding of the condition, show you how to accept it and offer you coping mechanisms. The best coping mechanism in my experience is education and acceptance. Understanding exactly what’s happening in your brain when you process certain sounds is incredibility liberating and can help take some of the sting out of an episode. Some coping mechanisms may involve CBT (cognitive behavioural therapy), others may involve physical manoeuvres or exercises and others may simply involve small changes to the way you operate in difficult situations. I hope you found this article helpful. If you’ve had experience trying to get misophonia treatment on the NHS, or any other health service, please let me know. I hope to follow this up with versions for other countries. I am 53 and have suffered with this condition since childhood. It has affected me in every aspect of my life. I am desperate to be helped. I always thought I was just some ‘nutter’ but when I Googled ‘dislike of eating sounds’ I was shocked to find out it has a name! I agree with everything you say. All my life (I’m 53 now) I have hated myself for being irritated by what are ‘normal’ sounds in life (and actions because even seeing someone chewing gum bothers me). It was such a relief to hear I am not alone. My brother tells me that when I was a child he would open his mouth and chew noisily because he knew it would upset me and I can’t even remember that far back! It would be great to meet other sufferers but I can’t find any support groups. If anyone knows of any meetings it would be great to know about them. My daughter has misophonia and if you have this condition, it is not an irritation, it is life changing. When she’s triggered it kicks in a fight or flight response. The anger that ensues is extreme. She can’t go to the cinema and eating out is really difficult. It has afffected all her relationships as people don’t understand, they say ‘oh yes that annoys me too’ but don’t get how much it affyhee and how she cannot control any of it. what you mean I too work in an open plan office where people spend just about the whole day eating, just as one stops smacking and chomping another starts up. What really annoys me is the constant clanking of a spoon on a bowl or scraping a plastic dish and as for talking with their mouthful don’t get me started. Work is a living hell. Outside of work I pretty much stay locked up alone in the house away from contact as much as possible. My son also has misophonia, now 12 and began with symptoms a year ago, but I did not understand what was wrong, he became very irritable, with the passage of time things got complicated and could understand what was happening and so I explained I did not believe what was thought it was bad behavior and punished, after months of suffering, explained to me several times until I decided to believe him and see … sorry this disease because it is so misunderstood, my son does not tolerate my voice … this is ugly because you do not know how to educate them … those who see us think that is spoiled because the suffering he feels is not physically but in their behavior, I have to find a way educate without causing stress with my voice. I’m 43.As a person who has since childhood grappled with the feeling of being wracked by certain annoying sounds which could be ignored by so many people,it is hugely heartwarming to learn that it’s actually a disorder being mindful that I once physically assailed a malicious neighbour who had formed a habit of deliberately making the bugbear sounds as a result! as her life and inability to tolerate noise in the workplace has left her feeling suicidal at times and unable to hold down employment due to her reactions to what most people would find an acceptable level of noise. I’m struggling with my daughter who has just turned 8. We now cannot watch a film together, as me eating or even clearing my throat drives her insane. I actually tell her I ‘get it’ as I myself have symptoms of this condition too but feel it has lessened and I have learned to control it over the years. I am going to have to visit go with her though as it is clearly now affecting our life as a family and I’m worried it will jeopardise her future in exams and employment further down the line. I so get the tapping of the computer. I work in a large open plan office and a man who sits about 10 feet away from me and does the loudest computer tapping I have ever heard. We have a privacy board between us thank goodness as there are times I could knock his block off. Hi Kayleigh, we’re here for you and we understand. I’m so sorry to hear what you’re going through right now. This can be such a painful and cruel disorder but I promise that you can live with this and you can lead a happy and fulfilling life. I’m worried to hear that you’re restricting with food and bruising yourself. Is there a trusted doctor/medical professional or teacher you can speak to? If you restrict on your food (and I have first hand experience of this with a close friend) it will increase your stress levels further and make the misophonia much much worse, so it’s really really top priority important that you take care of your body. I understand. My family is like that, every time I ask them to stop the open their mouth and snack as loud as possible, and the get super mad at me when I leave the room because I can’t stand the noises. They make me babysit my niece and she is at my house 3 days a week. It is absolute torture because she does everything in her power to make it worse for me, and to annoy me. The one thing that helped me a little bit was my cat, but I can’t be near her sometimes because of the noises she makes. Sometimes I just want to lose all of my hearing, so I won’t be bothered as much. I have had issues with sound for as long as I can remember. My earliest memories of this were when I was about 4 or 5 years old, and my dad was hammering nails into the wall to hang up some pictures. Each time the hammer hit the nail, I flinched – eyes closed, and I cowered away from the source of the noise. Not long after, the tinnitus started. It’s intermittent and doesn’t always affect me. I went to specialists as it was believed that I had some form of hearing loss or difficulty, but was told I was fine. As years went on, the reactions to noises got worse. In particular, eating noises, breathing noises and those who whistle when pronouncing the letter ‘s’. The list goes on to be honest… but when I hear on of these trigger sounds, the red mist rises, and I too have lashed out like Kayleigh (you’re not alone!) by hitting myself, punching walls and so on. I sit opposite a co-worker who triggers me every day with one of other of his noises, and I continually want to kill him (not that I ever would, I’d hurt myself before him) but my employer doesn’t understand the issue and isn’t willing to do anything. The trigger person is the kind of person who would make it worse just to wind me up further. At the minute, my other-half has a cough, and each time he coughs, it makes me jump out of my skin! Even when I can see him gearing up to a cough! Other reactions have included literally throwing friends out of my home, shouting at them and screaming because they were making noises I couldn’t handle… this then leads to a period of time where I break down until I snap out of it, or am snapped out of it by someone else. I’ve been through CBT for PTSD and Depression, but this never came up during any of the sessions. Reading this article has helped me to realise that there is something more going on than just a sensitivity to certain noises. I will be going to see my GP and seeing where I get to. Hopefully, at least I’ll get a diagnosis of hyperacusis at least! For me (aged 61) it’s really about eating-related noise. Chewing and rustling noises in the cinema (and theatre) kill me – why does even the local ‘posh’ cinema actively sell food and drink for consumption inside! At work it’s the tone of the china – I can hear it from anywhere in the entire building. Why does Jasmin have to stir her coffee 87 times in the morning? Why doesn’t Mike (and James and Emma and Olly) eat the cornflakes in the kitchen instead of at the desk? And now I have a name for it. Can’t tell you how much more normal I now feel … not a nutter, but a misophone. God bless Bose QuietComfort 35 Wireless Headphones. I am in a terrible situation. I have to feed my partner his meals. I wear earplugs. He clicks in the throat when he talks and I can’t talk to him for long. It’s destroying our relationship. I wish someone could help. I’m so glad I found this. I suffer with an acute reaction to the sound of fingers on a keyboard. However if it’s me doing the typing it’s not an issue. I get such a strong reaction I can become almost violent if i hear the sound for more than a few minutes. This has created an issue in that both my partner and I work from home and we’re both heavy laptop users. The arguments it causes are just ridiculous. Finally I have something to show her to prove it’s not me being a freak! My experience of receiving support from the NHS has been rather hit and miss. Firstly, I approached my GP about misophonia (having done initial research online and buying Misophonia books) and after some persistence I was then referred to my local ENT department. When it came to my appointment the ENT consultant said I have normal hearing and its just stress. I was not happy with his diagnosis and persisted further. I eventually got referred into the Centre for Hearing and Balance Disorders at my local hospital and seen an Audiologist. I believe I was lucky when I seen the first audiologist as she wrote a report that confirmed I had Misophonia. I later found out that this was unheard of from Audiology staff within the NHS, I believe she felt sorry for me at the time and could see that I was very distressed about the lack of support and understanding for Misophonia and was encouraged by the level of research I had undergone. I would also like to add that she was leaving her employment and was probably more likely to not be bound by procedure by mentioning that I have Misophonia in a letter to my Doctor. Since that initial Audiology appointment I seen the Audiology specialist at my local hospital and it was clear to say that she withheld less knowledge of Misophonia and willingness to confirm my triggers and everyday difficulties in a letter to my GP which was be provided to my employer (which at the time I required reasonable adjustments to be made) and my employer (at the time) only accepted a medical letter from a hearing specialist. It was safe to say that I felt bureaucracy in the system was holding me back from receiving further support. I then found Misophonia International and I read a lot of their articles, so I then approached my local audiology department and presented them with articles which disapproved of their actions – sound therapy and the use of white noise generators (exposure to sound). I had tried the white noise generators and found that they were not a viable coping strategy for working in an open plan office environment. So with the confidence received from Misophonia International I went to audiology department and informed them that their coping strategies are not working for me and I will be following other strategies. I then managed to get my employers to purchase noise cancelling earphones as a reasonable adjustment and I play music through the earphones to mask the noise. I was then discharged from my local audiology department, but before they discharged me they asked how my perception of severity of triggers had changed my mood. Before it was at a 10 and went to a 3 with the use of noise cancelling earphones. After my discharge I later discovered that this audiology department gives patients misophonia international email to patients that display misophonia and hyperacusis symptoms. I discovered this as a friend of mine’s son also displayed misophonia symptoms and he received a referral to the same department. My only criticism is that this audiology department is still following the over exposure (white noise generators use) method and advocating self referrals into IAPT or MIND services for CBT. Anyway, that was my experience of seeking support with Misophonia within the NHS. Thanks for recounting your experiences with the NHS Adam. Misophonia International are great and it’s definitely worth checking out their stuff. Yes, the varying levels of understanding are frustrating. To be honest until misophonia is ‘officially’ recognised (it’s not in the USA’s DSM-5, or on the World Health Organisation’s ICD yet) it’s very difficult for any medical professional to diagnose and/or offer consistent treatment for our disorder. We need to keep that pressure up for awareness and it sounds like you did a great job going in there armed with info. Hi Bilge, I’m so sorry to hear what you’re going through. Though some of us here are a little longer in the tooth (I’ve started making that ‘ooh’ sound when I get from chairs) we all remember what it was like to be 15 and go through this. In my opinion it definitely gets easier with time. You’ll develop more effective coping mechanisms that are right for you (the secret is to try different approaches). Also, and this is the main thing, you have a lot more control over your environment as an adult. I often found school and home life unbearable precisely because you can’t escape. That changes when you get older because you can choose where and who you live with and how you work. Anyway, keep your chin up. Remember, a lot of folks share comments when they’re at their lowest ebb, so some of what you read will be people feeling overwhelmed in the moment or letting go of some of that pain. It’s completely understandable, but it also means you won’t necessarily see all the joy, curiosity, excitement, magic and happy things that they also experience in their lives. Misophonia is something that is part of us but the negative aspects dont have to define or rule us. Keep your chin up, you can do this. By the way, do check out the My Miso Story section on the site as there are a lot of younger readers’ experiences shared on there as well. I am 46 and am desperate for help! This article has definitely helped me though. My worst triggers are eating noises or any other kind of oral tick or slurp. I have even found that my dogs licking their lips and generally smacking their gums drives me bonkers! I have suffered with this since I was about 10 years old. The worst trigger then was my older brother’s eating sounds or the sound of him picking his nose (yes, he made a faint sound). Looking back to when my children were growing up (they are now 15 and 19) in the days prior to realising that the problem was my own, I was hard on the kids for making eating noises. Sometimes too hard. Nowadays, I try to deal with the discomfort I feel by either leaving the room or putting earphones in. Undoubtedly though, it is putting a lot of stress on my 7 year relationship with my fiancee who despite being a fellow tinnitus sufferer, doesn’t seem to comprehend the effect the misophonia has on me. It is also affecting my work because I work in a quiet office with about 5 workmates who all eat at their desks. The colleague right next to me happens to have appalling eating habits and doesn’t close his mouth when chewing! IT MAKES ME FEEL SO ANGRY! Unfortunately, I am not in a position where I feel I can raise the issue. Gosh, I have just been listening to Radio 2 discussing this. I feel I have it too. Cinemas, trains, buses are all just too much. I have had a row with kids playing a boom box on a bus; argued with people in the cinema (so haven’t been back for 10 years), and people walking through a shopping centre and letting their shoes flap on the floor makes me want to ask them to kindly pick up their feet when they walk 🙂 I rarely go out as a restaurant meal will be ruined if the acoustics or other customers are over loud or have a screaming toddler. The amount of jobs I’ve had and left due to radios being on in the background, or other such noises. It’s a miserable life when you can’t join in fully without feeling intensely irritated. I am not alone!! I was 7. I wanted to knock the cup out of my mom’s hand when she was drinking. Not just the sound but how she put the cup to her mouth… I’m 49 now. Still have it. I wear ear plugs for family meals. I feel such rage when my husband eats or drinks – & he does this lip smacking thing after he’s swallowed… arghhh!… I can’t even look at him when he chews. The ear plugs are a godsend. Snoring sends me mad.. people using leaf blowers… why?? Why would you do that?? But definitely eating & drinking is my thing.. and gives me such intense rage.. someone eating cereal and slurping the milk and bits that are falling off the spoon… omg.. or someone eating an apple and slurping back the juice.. taking a big loud bite… grrr… I used to want to kill my ex husband because of how he held his arm up when he was about to drink… Oh my goodness I sound like a complete crazy woman…. I’m not. I’m actually a sensible and level headed healthcare professional with friends and family. I took my daughter (9) to the GP about this.The GP had never heard of the condition and seemed more concerned with the fact my daughter wouldn’t talk. She was referred to CAMHS and diagnosed with Selective Mutism, however, the Misophonia wasn’t even known about to Mental Health specialists. We are hoping that the Cognative Therapy Treatment she will eventually receive, will help both disorders, but we are already 17+ weeks of waiting for an initial appointment. 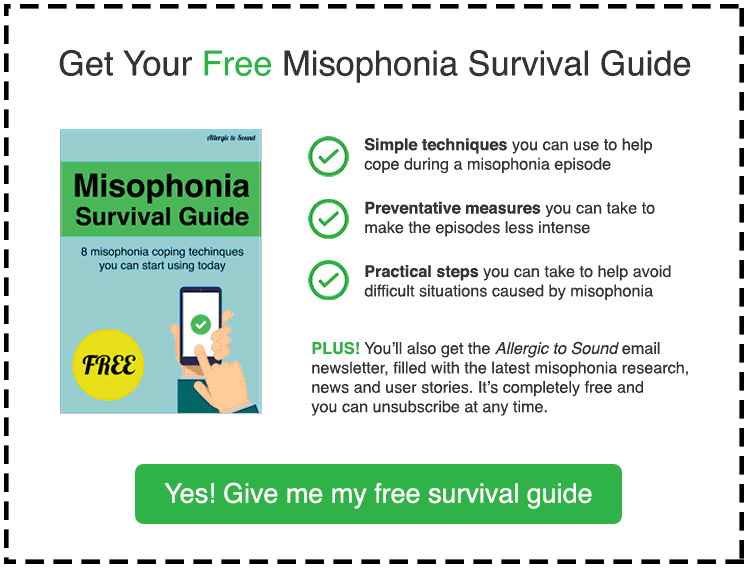 I have recently become aware of Misophonia as a diagnosis having suffered with this condition as far back as I can remember, it was my daughter in law who alerted me to this and I started reading all about it. I did however feel that perhaps I had a medical condition because I seem to have an unnatural reaction to different types of noises, I would look around me and no one else appeared to be affected and certainly no one else was complaining about noise nuisance. I can identify with many of the comments here, the triggers and their reactions sum me up perfectly and brings about physiological changes, I breath a sigh of relief that I am not alone but I am also disappointed that the condition is not officially recognised. I wonder how many ASB issues which have involved the Police Dept and the Judicial system may have been linked to this undiagnosed condition. I struggle with this on a daily and I am never without my music and earphones to reduce/dampen down any noises, I also have slight tinnitus at times and I completely understand and empathise with all concerned, may we all find coping strategies until we are able to access proper medical support that resolves this issue. I have suffered with this since I was about a young teenager (now 27). It has got steadily worse over the years to the point where I am now on the verge of tears almost every day because of my triggers. People eating, sniffing, biting their nails, the sound of skin rubbing against paper when writing…even visual triggers set me off because at work I am (thankfully) allowed to wear headphones and so even though I can’t hear the noise, just seeing the action that makes it results in me having an overwhelming urge to hurt the person who is making the noise. My social life is non-existent, I can’t stand eating around family and friends and even my work life has started to be impacted as the thought of going in to a small meeting room with people eating, tapping, sniffing etc. makes me feel physically sick. Glad to know I am not the only one out there who suffers with this! Thank you all for sharing your difficult experiences. My teenage daughter has manifested these exact symptoms over the years and whilst we have tried to be sympathetic and offer coping strategies I never realised such a condition existed. She had an acute sensitiviy to fire alarms as a toddler – went into a white panic whenever an alarm sounded. Could not bear loud noise such as fireworks. School has been a particularly difficult environment with noise levels, clicking, foot tapping, pencil tapping, nail biting, food munching all very stressful. She goes everywhere with her iPod and earphones in order to shut it all out. I feel terrible for not having truly understood how destructive this condition can be. Will follow your links and guidance with my daughter to try to help her with the challenges that lie ahead.